This white, eggless cream was a sweet my mum used to make when I was little. It is perfect for summer and very easy to make. You can ommit the almonds if you like. It will be equally delicious. 1) In a deep pan mix the milk with the fresh cream. Add sugar and gelatin. Mix well and boil in low heat by stirring continuously the mixture with a hand whisk all the way through. 2) Allow to cool for 15 minutes and then add the peeled almonds. Stir well. 3) Pour the mixture in a deep gelatin form. 4) Allow to cool completely and refrigerate for at least 24 hours. 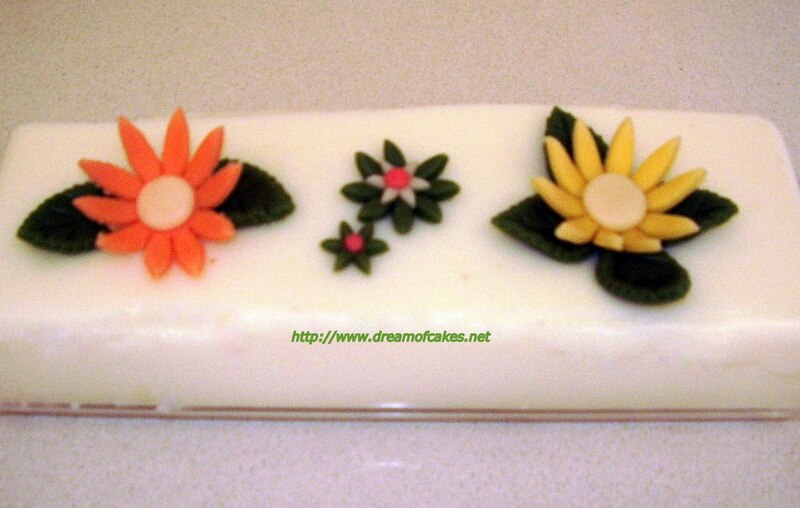 5) Decorate the cream the way you wish. Yum-This dairy dessert sounds pretty tasty and it makes for a lovely presentation. Yum! This is beautiful, so great for a spring garden party! Milk or cream set with gelatin is very popular in the Philippines. Fruits are usually added but I like the almonds you've added to yours. Delicious. This sounds very tasty.... very much like an Asian dessert my mother would buy when I was a kid. This is so cute. I love that it can be decorated anyway you like! Thanks for sharing this great recipe and your memory. So you and your mom are both cake mavens?! Amazing. What fun you all must have at family gatherings - I can just imagine the table of desserts. This, of course, looks beautiful. I am getting bored of my regular buttercream icing. This looks very tasty and i like the additiion those almonds...i gotta try this asap! Hehe. What is mastic powder? I haven't seen it around yet.... Maybe it's called something else here... Any idea? I have to tell you that I look forward to each of of your posts. BTW - what is "mastic powder" ? The mastic powder in greek is called "masticha" I will give you a link to a previous post I have, where you can find all relevant information. It is a product you can find ONLY in the island of Chios "ΧΙΟΣ" and it is exported in the whole world. I am sure you will love it. The taste and smell of masticha is excellent!! It sounds like something that I would love to try. Beautiful! Is it similar to the italian panna cotta? Thanks for visiting my blog! I love your cakes - so impressive. The Mickey Mouse cupcakes are so cute - and they look manageable to recreate! This looks beautiful and sounds delicious and with those flowers on top .. pretty! Very delicious i love it. Nice, I might try this with agar agar powder instead of gelatin to make it vegetarian. It looks lovely! What a fun recipe. I never heard of it before.I'm going to keep this in mind. Thank you for visiting my blog. I'm planning to translate my recipes/ blog. I'll keep you posted. Where do you live that you use metric measurements. Curious. Very pretty dish and a very pretty name. I am also getting educated yet again as mastic is a well known word here in the UK but I have researched more of it's use and source in Chios, very interesting, thank you. I like that it's eggless. Lovely!